Plymothian Transit: X38 split and halved? PH1020951/40 - STAGECOACH DEVON LTD, BELGRAVE ROAD, EXETER, EX1 2LB Variation Accepted: Operating between Exeter Bus Station and Buckfastleigh Station Approach given service number X38 effective from 11-Apr-2011. To amend Timetable. As you can see the service has been split into two at Buckfastleigh. This is due to the European driving hours legislation which has seen quite a few long distance services split this way. If I read this correctly it does appear that there are to be only 8 journeys each way which seems a lot less than the current timetable. Sundays seem the same three runs each direction. It isn't split at all; the buses will still work through, and so will the drivers. All that's split is the registration. Yes, it is a stupid rule, why do you ask? 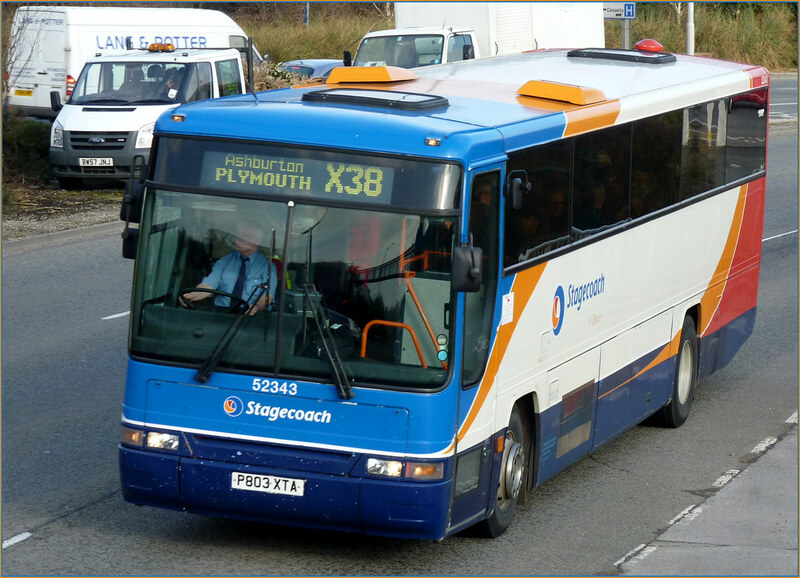 It seems it will still be hourly between Exeter and Buckfastleigh with only 8 journeys a day operating to Plymouth Bus Station. what happened to the bendi- coaches this route or has numbers drop big time?